For as long as he could, Fermín “Mike” Guerra kept playing baseball all year around, in his native Cuba and in the United States. The two lands obviously had quite different cultures, baseball and otherwise, and Guerra even told Roberto Gonzalez Echevarría that he had been initiated into santería, the particular syncretic Afro-Cuban religion.1 Fermín Guerra Romero was born in Havana on October 11, 1912. His father and mother, Fermín Guerra and Cecilia Romero, came from a Spanish possession, the Canary Islands. His father worked as a commission merchant, which may or may not sound more grandiose a trade than it actually was. The phrase could apply to a street vendor. His family were isleños, Canary Islanders who had come to Cuba looking for better opportunities, a group that also included the family of Cuban pitcher Conrado “Connie” Marrero. 2 Many of them were brought to Cuba as laborers to work on building the railroads and other infrastructure. Guerra was illiterate and raised in poverty. He may have attended primary school for six years, as he claimed on his player questionnaire for the Hall of Fame, or may not have attended school at all, as reported by Gonzalez Echevarría. He batted and threw right-handed and described himself as 5-feet-10 and 155 pounds. Gonzalez Echevarría says he began in baseball playing in the Cuban capital’s empty lots, and then as a batboy at Havana’s Almendares Park, working for the team he would later manage. Baseball was played with a passion and at a very high level in Cuba; a number of Cuban ballplayers were signed to play in the United States. The two spheres – Cuban League baseball and organized baseball in the United States – co-existed rather well in the 1930s, and a number of American teams traveled to Cuba for exhibition games before the outbreak of the Second World War. Immediately after the war, the spring exhibitions resumed (the Red Sox, for instance, played some spring games in Havana) but rather quickly it became evident that a new accommodation or arrangement was necessary. The Pasquel Brothers of Mexico were active in trying to sign U. S. major leaguers to play in their Mexican League (they traveled to Havana and made lavish offers there to players such as Johnny Pesky and Ted Williams). The advent of integration in 1947 with Jackie Robinson, and others soon to follow, changed baseball in the United States. Underlying it all, there was also the return to action of hundreds of ballplayers – such as Pesky and Williams, and Robinson – who had been in military service during the war. Guerra started his professional career well before the war, late in 1934 and after the first of the two revolutions which bracketed his baseball career. After a suspension of the Cuban constitution, and a couple of coups, including 1933’s “Revolt of the Sergeants,” the man wielding power from behind the scenes was Fulgencio Batista. Though he didn’t take power personally until 1940, his firm rule truly began in January 1934, concluding a period of disruption. That November, when the 1934-35 Cuban League season began, with three ballclubs, Fermín Guerra was the main catcher on the Habana Reds (no political connotations to the color) ballclub. He had 99 at-bats in the 28-game schedule, batting .162 with one homer and seven RBIs under manager Miguel A. González. A fourth team, the Santa Clara Leopards, was added in 1935-36, with Martín Dihigo (11-2) leading the Leopards to first place. Guerra was the second catcher, behind Ramon Couto, collecting just 79 at-bats (.203) but having the opportunity to catch Habana’s new pitcher, Luis Tiant, in addition to the established Gilberto Torres. Many years later, the left-handed Tiant’s namesake son became a near Hall of Famer in the United States. Legendary Senators scout Joe Cambria made Guerra among his first of many Cuban signings. Guerra trained with Washington in the spring of 1936, was transferred to Albany before the spring was over, had all of one at-bat, and then was with the last-place York White Roses/Trenton Senators for most of the ‘36 season (the York team moved to the New Jersey capital on July 2). Guerra hadn’t helped much on offense; he batted just .161. The reigning world champion New York Giants visited Havana 2½ weeks in late February and March 1937, and played a series of seven games against various Cuban teams – winning only two of them. Guerra caught pitcher Rodolfo Fernandez in the March 6 game, a 4-0 four-hit shutout administered the Giants. Guerra spent most of 1937 playing for Jake Flowers and the Salisbury Indians, a Class D team in the Eastern Shore League affiliated with Washington. He hit .296 with 14 home runs. Salisbury went from last place in 1936 to first place in 1937, took the pennant and the playoffs, and saw the “fleet-footed Cuban” Guerra named the All-Star catcher for the league.6 Planning almost three weeks ahead, Washington owner Clark Griffith announced that pitcher Joseph Kohlman, who’d won 22 games in a row, would start on September 19 and pitch to his batterymate, Fermín Guerra. Kohlman’s debut turned out not to come until one week later, on the 26th, but Guerra debuted with the Senators on September 19, 1937 – and then didn’t play again in the major leagues until 1944. That first appearance came in the second game of the Sunday September 19 doubleheader against the visiting Chicago White Sox. The Senators won the first game in the bottom of the ninth, 5-4. Starting in the second game was pitcher Red Anderson, also making his major-league debut. Guerra was the catcher, batting eighth. Anderson couldn’t get through the third, and by the time he was pulled, the White Sox had a 7-0 lead. They won the game, 9-1. Chicago’s Vern Kennedy threw a five-hitter and Guerra was 0-for-3 at bat, striking out twice. He had three putouts (on strikeouts) and made one foolish error, throwing the ball wildly to second base (and into center field) in an attempt to cut down Mike Kreevich, who was running toward second. The problem was that Anderson had thrown ball four and Guerra’s throw wouldn’t have resulted in an out even if it had beaten Kreevich to the bag. The game was called after eight innings on account of darkness. One imagines Guerra ran his debut game through his head for a long time. Had the ninth inning been played, Guerra would have been up fourth and might have had another chance at a hit. As it was, he had the one game and then six more years of waiting to return to the majors. That winter, Guerra returned to Cuba, catching for Marianao and manager (and future Hall of Famer) Martín Dihigo, hitting .286. He was back with Salisbury, for 19 games, in 1938 and hit .323, plaing a couple of games in Class B with the Charlotte Hornets, too. In 1938-39, he was back with Almendares catching for Luque’s team. More Americans were joining some of the Cuban teams. The catcher for Santa Clara that year was one Josh Gibson. One of Guerra’s teammates was another Hall of Famer, shortstop Willie Wells. It goes without saying that this was first-rate baseball. Yet another big-league club traveled to Cuba in the spring of 1941, and this time it was the Brooklyn Dodgers who learned first-hand that the Cubans could be difficult opponents. In the first of five planned games, the battery of Gilberto Torres and Mike Guerra held them to one run on five hits, winning 9-1. Durocher’s Dodgers turned the tables two days later, 11-4; Guerra had to be carried from the field in the third when Pete Reiser’s bunt went off his knee. 11 They split the series, two wins apiece and a tie. It was about a month before Guerra got back into action. He and Reggie Otero joined the Springfield Nationals for spring training at Anderson, South Carolina. One month after that, he was called up to Washington, after they traded Rick Ferrell to the Browns in mid-May. He was ready to help, and it’s not as though the team couldn’t have used a kick-start from somewhere; from May 18 to May 30 the Senators lost 12 games without a win. Still, Harris was content to let Jake Early do the catching and didn’t put Guerra into even one game. After dropping a doubleheader to the Athletics on Memorial Day, when the Senators boarded the train for Chicago, Guerra wasn’t with them. It looked like he’d jumped the team: “He called for his pay check at Griffith Stadium yesterday and presumably headed for his native Cuba. During his five years with the Washington organization, Guerra has intermittently returned to Cuba A. W. O. L.” 12 Guerra had appeared in 20 games for Springfield (.300) and later in another 31 for Greenville (.244). The fans were going to have to forget about Early, at least for a couple of years, because he passed his physical in February and was preparing for induction into the Army. Cambria promoted Guerra’s cause once more: “He’s an artist behind the plate and he can hit. And he’s fast on the bases.” 14 A snag seemed to crop up when six Cubans failed to show up in College Park, Maryland for the first week of spring training. Griffith was worried that one – or even all of them – might have decided to play baseball in Mexico instead. Manager Ossie Bluege was immensely relieved when the Cuban contingent turned up. Ten Latin players were depicted in a photograph which ran in the March 26 Post. Rick Ferrell had come back from St. Louis by trade; he contended with “Cuba’s Mighty Mite” (Guerra) for the catcher’s job. Ferrell was an established veteran, heading into his 16th year of what was later recognized as a Hall of Fame career. Guerra, “a bantam model backstop,” was making a name for himself with his bat and seemed sure to stick. 15 A hand injury to Ferrell in the early going gave Guerra more playing time, too. There was a scare in mid-July when the Cuban players were deemed “resident aliens” and received instructions to register for the draft within 10 days; word was that some of them – including Guerra – were leaving the team. On July 16, Guerra quit (with Gil Torres and Roberto Ortiz) and returned to Havana, but it was only for a short period of time before it seemed somewhat safe to return. He’d meanwhile been offered a contract to play ball in Mexico, but Griffith wouldn’t give him his release. Guerra registered for the draft, but not been called for a physical. He got into 75 big-league games in 1944, hitting .281 and otherwise posted stats similar to Ferrell’s but marginally better. In 1945, he joined the team in mid-March and again was Ferrell’s understudy, but his average dropped off all the way down to .210. After the season was over, Gil Torres, Guerra, and others were warned not to participate in winter ball with other players whose status in organized ball was under question. The brothers Pasquel were approaching many of American baseball’s biggest stars and offering large bonuses to play in Mexican League baseball, there was then question raised as to whether or not Cubans who played in the Cuban League would be subject to the same sanctions as Major League Baseball sought to preserve its monopoly status. To be banned from playing American ball would have been disastrous economically for a player such as Guerra, should alternatives like the Mexican League not prove viable. It’s for this reason that he played the 1946-47 season for the Oriente ballclub (managing it as well) in the Liga de la Federación, a separate entity from the Cuban League. Jake Early was mustered out of the service and re-signed with Washington in December 1945, but Rick Ferrell retired in February 1946. The Senators didn’t know if Guerra was coming back or not for the ’46 season. When Senators owner Clark Griffith was told that Guerra had been playing ball in Havana in November 1945, he said he had no information in that regard but alluded to unspecified “consequences” if that were true. 16 He’d reportedly been offered some good money to play Mexican League ball, and even taken a $2,000 advance from Jorge Pasquel. On March 13, however, the Los Angeles Times reported that Guerra had “reconsidered his Mexican contract and rejoined the Washington Senators.” It was relatively easy – the Senators had come to him, and were back playing some preseason games in Havana once more, including a couple against the Boston Red Sox. Apparently, Guerra was reluctant to give back the advance to Pasquel without a pay raise from Washington. In 1947, Mike Guerra hit .215 for Philadelphia, backing up Buddy Rosar. In 1948, he played in fewer games (53 to 72 the year before) and hit .211, again second to Rosar. It was time for the first Caribbean Series, and the flag-winners, Almendares, were the Cuban entry in the February 1949 contest between teams from Puerto Rico, Panama, Venezuela, and Cuba – that first series to be played in Gran Stadium, Havana. There were some Cubans on the other teams, but the Venezuelan team had no Americans on its team (not being a party to the pact with Organized Baseball in the U.S.) Fermín Guerra was the manager of the Cuban team. His outfield was almost exclusively American: Al Gionfriddo, Sam Jethroe, and Monte Irvin, with Santos Amaro getting four at-bats. Cuba (Almendares) was undefeated, winning all six of its games. Fermín Guerra was the Most Valuable Player for 1949-50 Cuban League baseball, as player-manager for the Almendares Blues, hitting .304 and helping lead his team to the flag. Guerra didn’t start the season playing, but once the ban on U.S. major leaguers playing for Cuban teams was lifted, he assigned himself the role as the team’s catcher. The second Caribbean Series was held in Puerto Rico, in San Juan, in February 1950. Almendares represented Cuba once more, Guerra as manager, but it was Panama beating out Puerto Rico for the title. Guerra turned up late again – and an Associated Press story said, “The little Cuban catcher always waits until just before the start of the season to put in his arrival. By the time he gets into camp, the A’s usually have forgotten he is on the club – but, by the end of the season, Guerra almost has caught the most games of any of the A’s catchers.” 24 Unsaid here, but noted in other accounts, was that because Guerra had usually stayed in shape by playing ball in Cuba, he needed less time to get ready than most American ballplayers. He had another strong year for Philadelphia, batting for a .282 average – his career-best in the majors. On December 13, 1950, the Boston Red Sox sold catcher Birdie Tebbetts to the Indians and bought Mike Guerra from the A’s. In February, the Red Sox bought Al Evans from the Senators. With Buddy Rosar on the team, it was like a reunion of sorts. Bucky Harris and the Senators were said to be hoping to buy Guerra from Boston. Having three Cuban pitchers (Conrado Marrero, Sandy Consuegra, and Julio Moreno) on his team, Harris could use the help in communicating with them. 25 Heading into spring training, the Red Sox weren’t sure which catcher (Guerra, Evans, Rosar, or Matt Batts) would be Steve O’Neill’s main backstop. “If O’Neill were to pick his man on defensive ability,” wrote Ed Rumill, “he probably would lean toward the cat-like Guerra, who also has a stinging bat, but does not hit the long ball.” 26 There was a minor squabble at the end of March over meal money, with Mike turning in his uniform, but things were worked out. 1951 was Guerra’s final season in major-league baseball. He accumulated 231 plate appearances and hit .201, with 20 RBIs. In all, Mike Guerra played in parts of nine season, hitting .242 (respectable for a catcher in his era) in 545 games and with 1,750 plate appearances. His career on-base percentage was an even .300. He scored 168 runs and also drove in 168 runs. On the first day of 1952, Guerra got the job he wanted most, manager of the Havana Cubans, the Florida International League farm team of the Nats, taking over from Adolfo Luque. The job lasted just the 1952 season. He wasn’t finished playing baseball, however. For the 1952-53 Cuban League season, Almendares replaced him as manager, hiring an American manager, Bobby Bragan. Guerra became manager with the Marianao Tigers, and gathered another 173 at-bats (.220). He hit .255 in 220 at-bats in 1953-54, and started the season in 1954/55 again as manager, but was replaced in midseason by Napoleón Reyes. He’d had seven hits in 41 at-bats (.167). That was his last season as a player. Figueredo’s Who’s Who in Cuban Baseball 1878-1961 shows him with a career batting average of .250 in 20 seasons of Cuban ball. In 1954/55, Fermín’s brother-in-law Regino Otero had become manager for Cienfuegos. In 1956, the two came up against each other in the Caribbean Series, Otero and Cienfuegos being the winners, over a Venezuelan team that Guerra managed. Guerra next turned up as manager for Habana for three seasons, 1958/59 through 1960/61. In his final season as manager (the final season of the Cuban League, given the advent of the Cuban Revolution), his winningest pitcher was Luis Tiant, Jr. In between, Guerra worked as a full-time scout for the Detroit Tigers, the appointment announced in November 1959. He scouted for the Tigers from 1960 through 1962. 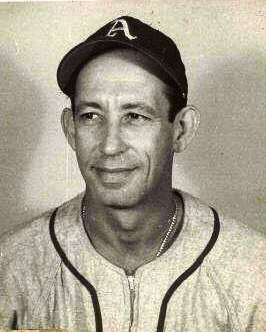 Fermín Guerra was elected to the Cuban Baseball Hall of Fame in 1969, several years after the Hall was moved to Miami. Two days before his 80th birthday, after a long struggle with heart disease, Guerra died at Mount Sinai Medical Center in Miami Beach. It was October 9, 1992. He was survived by his wife and daughters. In addition to the sources noted in this biography, the author also accessed Guerra’s player file at the National Baseball Hall of Fame library, the online SABR Encyclopedia, Retrosheet.org, and Baseball-Reference.com. 6 The phrase comes from the August 31, 1937 Washington Post, in an article reporting that five key players had been sold by Salisbury to the Senators. 7 Washington Post, September 21, 1937. There is a confusing item to note parenthetically here. In his March 3, 1954 column in the Post, Povich wrote of Guerra, “He didn’t cotton to playing ball in the United States on his first trip with the Nats. They pulled out for Boston on the Federal Express one night and Guerra decided not to make the trip. He was homesick. They next saw him two years later.” What this refers to is unclear. In 1937, there were only 10 dates remaining in Washington’s schedule, during which they played 15 games. None of them was in Boston. All of them were home games except for the final series in Philadelphia, after hosting Boston. In an earlier column, in 1951, Povich told the same story but placed it in 1934, two years before Guerra is known to have been in the States, and during a year when Harris was managing the Red Sox. 10 Gonzalez Echevarría, op. cit., p. 406. A nice photograph showing both Guerra and Regino Otero appears on page 216 of Jorge S. Figueredo’s Cuban Baseball: A Statistical History, 1878-1961. 15 Washington Post, April 5, 1944. Povich said that Guerra had jumped the Chattanooga team late in 1943 to play ball in Mexico, but had been lured back by Joe Cambria. 22 Ibid., pp. 70, 71. Cultural differences often took a toll; the author adds that as many as 14 Americans had to be shipped from the Cuban League back to the States for one reason or another.